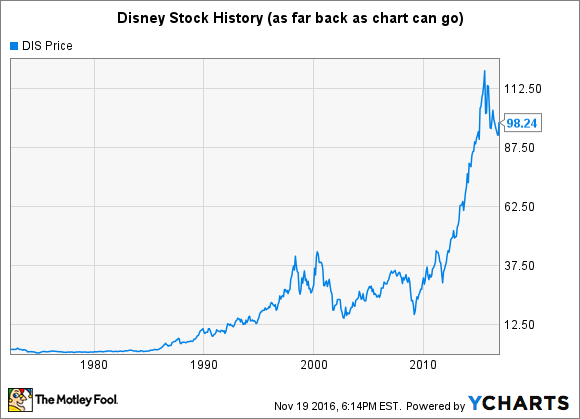 Disney Stock History -- Will Shares Regain Their Magic? Disney's stock history shows shares have come roaring back from troughs much deeper than their current 19% off the all-time high. Walt Disney (NYSE:DIS) stock has proved a great value for investors who have bought it and held on for the long run. Its market-beating total-return performance reflects its superb stock-price appreciation helped along with its growing dividend, which currently yields 1.45%. However, over the past 15 months, the world's most diversified entertainment and media conglomerate has faced public challenges relating to cable cord-cutting. These concerns have caused its stock to decline about 19% since setting an all-time high in early August 2015, with some wondering if it will ever regain its mojo. Let's take a look at Disney's stock history with an eye toward providing insight into the question: Are Disney's best days behind it, or is more magic to come? The chart above gives you a sense of Disney stock's fantastic performance over the long term. Now let's dive into some details. While the company was founded as an animation studio in 1923, it wasn't until 1938 that it incorporated. By this time, it had been a decade since it released its first huge hit, Steamboat Willie, one of the first cartoons with sound that featured Mickey Mouse. In 1938, the Great Depression was nearing its end, but it was still roiling the world's economy. While the Depression officially ended in 1939, its lingering effects were felt in the U.S. until we entered World War II in 1941. The fact that a purveyor of what most would consider a "non-essential" product, animated movies, survived the Depression is a testament to its resiliency. Founder Walt Disney was shrewd when it came to the timing of the stock's initial public offering (IPO). The common stock began trading over the counter (OTC) in 1946, just as the post-war economic boom was getting under way. During the 12 years the stock traded OTC, Disney continued furthering the development of animated film and in 1955 essentially invented the modern-day massive theme park when it opened Disneyland in California. Acquiring ABC TV, which brought cash-cow sports cable network ESPN into the fold (1995). Acquiring movie studios Pixar (2006), Marvel (2009), and Star Wars creator Lucasfilm (2012). Opening Shanghai Disney Resort (June 2016). Acquiring a 33% stake in video streaming leader BAMTech (August 2016). Since 1957, Disney stock -- which became a component of the illustrious Dow Jones Industrial Average in 1991 -- has split six times, resulting in the blossoming of one share into 384. At today's price of about $98 per share, that $13.88 invested in 1957 would now be worth approximately $37,632. Moreover, this tidy sum would now be paying out about $542 in cash dividends per year, as Disney's stock annual yield is currently 1.45%. Of course, that one share would be worth considerably more than 384 shares now if the dividends were reinvested. It would also naturally be worth more if the shares were scooped up before 1957 while they were trading OTC. Of course, because of inflation, those amounts shown invested are greater in today's dollars. One dollar in 1957 had the same buying power as about $8.57 today -- meaning $13.88 shelled out for a share in 1957 would be equivalent to plunking down about $119 today. Nonetheless, Disney stock appreciation has been magical over the long haul. Can Disney stock regain its magic? Nobody can know for certain if Disney stock will shake its current doldrums, surpass its all-time high, and resume generating market-beating returns for investors. However, there's every reason to believe it will do just that. Past stock performance is no guarantee of future performance. However, performance over the long term is certainly indicative of a company's sustainable competitive advantages and how successful its top management has been at exploiting those advantages. While it's understandable that some investors are bemoaning the approximate 19% decline in share price over the past 15 months -- a period when the broader market gained about 4% -- such declines are common not only for Disney, but also for many stocks. Disney's stock has come roaring back after much bigger declines many times in its history -- and, in fact, twice in the 2000s alone, as the following chart shows. 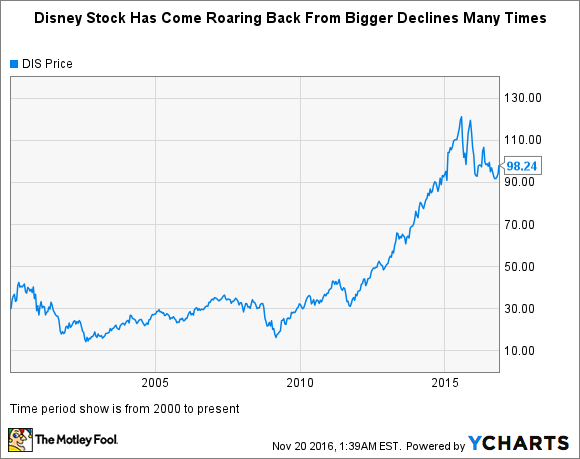 The steep stock-price drops in the early and late 2000s look like hiccups in the chart because the stock has since soared. However, Disney stock lost a whopping 67% -- or two-thirds -- of its value in the 22-month period from October 2000 to August 2002. Granted, the overall market was also down considerably during this period because of the bursting of the so-called dot-com bubble. However, Disney stock was much harder hit, as the S&P 500 lost "only" 36% of its value during this same period. Disney stock also lost ground during the Great Recession in the late 2000s, though its 57% decline during the 22-month period through March 2009 closely mirrored the decline in the overall market. While Disney came roaring back from both of the steep declines in the 2000s, there's another factor to further bolster the argument that the stock will likely bounce back from its current trough: Disney's year-over-year earnings decreased during those past two periods, whereas it just reported record earnings in fiscal 2016. In other words, it's the market's fear of an earnings decline, rather than an actual earnings decline, that's been suppressing the stock. Sooner or later, it seems likely the market will justly reward the company for its fine recent financial performance.